The Uganda Red Cross Society says efforts to recover bodies believed to have been buried by mud and heavy boulders in Buduuda district are still futile due to lack of equipment. 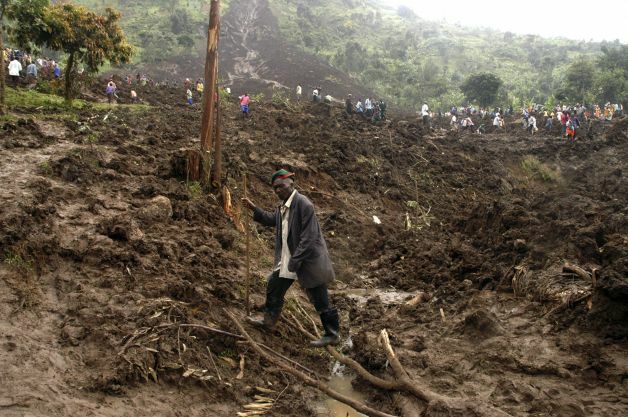 An estimated 400 people still feared unaccounted for, following a series of devastating landslides that buried two villages of Namaaga and Bunakasala in parts of the mountainous Bugisu sub region in Eastern Uganda. According to the Red Cross Society, about 18 people are still missing while nearly 450 have been displaced. The society’s secretary general Micheal Nataka says residents are willing to take part in digging up of the mud but lack still the essential equipment to enable them fulfill the task. Nataka says since the mud is heavy, ordinary hoes and other garden tools are no longer useful. He adds that a team of 28 volunteers has already been dispatched to the affected villages to assess the magnitude of damage caused by the landslides. Meanwhile, the state minister for refugees and disaster preparedness Musa Echweru is expected in Bududa later today to assess the situation and also deliver emergency aid items to the landslide victims.